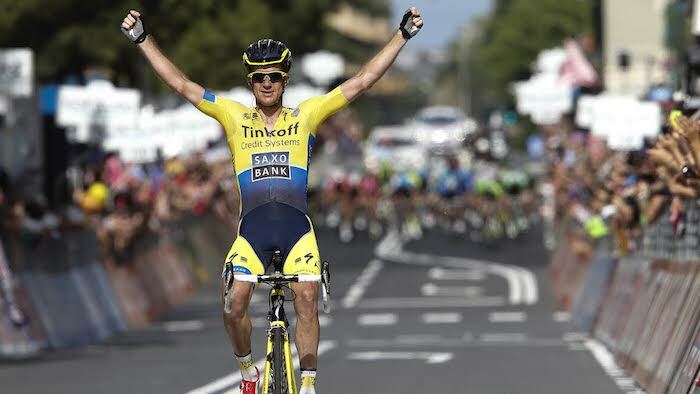 Michael Rogers (Team Tinkoff Saxo) took a gamble during the 11th stage of the Giro d’Italia. At the top of the final climb, and still with over 20km to go, Rogers attacked the peloton then single handedly held them off to take his first victory in a Grand Tour. 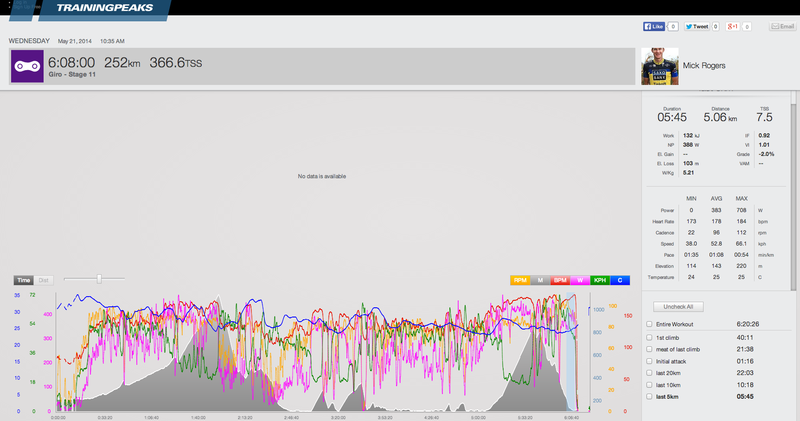 Here is a look at what kind of power it takes to solo to victory at the Giro d’Italia. Click here to see his full SRM data. During the early first climb over the Category 2 Passo Cento Croci Rogers had a Normalized Power® of 387W, or 4.86 W/Kg to stay at the front. Those 22km passed in just over 40 minutes. This is certainly a solid effort but it didn’t drain his reserves. During the final climb, a Category 2 ascent of the Naso di Gatto, Rogers’ held 410W for 21 minutes, or 5.44 W/Kg. During that time he expended 520 calories. This effort kept Rogers in position to lauch what would be the winning move. The initial attack was viscious. Rogers’ exploded from the peloton putting out 467W for 1:16. This created the gap he needed on the descent to the finish. After 5 hours of racing, during which he averaged 321NP, and after his attack, Rogers still had the reserves to put down some big numbers. Powering downhill he averaged 379NP for the last 20km. In the last 10km his average NP was 376W. In the final 5km, with the peloton chasing hard, he turned up the effort even more, averaging 388NP to take the win by a scant 10 seconds. In the last 20km Rogers’ average speed was just over 55km/h (34mph) and he burned 479kj in the span of 22 minutes. This illustrates the amazing capability a rider must have to win at the highest level. For Rogers, this was his first individual victory at a Grand Tour and it was an amazing effort. With the right timing and a tremendous effort he took a deserved win.